Other than the full Moon, nothing in the night sky inspires more poetry than the twinkling of the stars. It inspires astronomers to say a few choice words, too, but few of them are printable. That’s because the same effect that causes the stars to twinkle also makes them look like fuzzy blobs through a telescope. Even worse, the atmosphere absorbs many wavelengths of energy, making it impossible to observe much of what’s happening in the universe. The solution is to raise a telescope and its instruments as high above the ground as possible. In the early part of the 20th century, that meant building observatories atop tall mountains. Later, it meant lofting them with balloons. And by the 1970s, it meant lofting them into Earth orbit or beyond, providing a crystalline view of planets, stars, galaxies, and the rest of the universe. Since then, space agencies around the world have launched dozens of telescopes into space, and their results have been spectacular. Even so, space-based telescopes are expensive to build and operate so only a few are working at any given time. So most astronomical observations are still done from the ground. But like their orbiting cousins, today’s ground-based telescopes are built with Space Age technology. Advances in mirror making, electronic detectors, and computer control systems have made it possible to build bigger telescopes at a fraction of the price of those built in the early 1900s. These new telescopes see deeper into space than older instruments, provide sharper views of astronomical objects, and parse light into its individual wavelengths more efficiently. These powerful new instruments are opening new scientific frontiers, allowing astronomers to look into regions of the universe where no one has looked before. 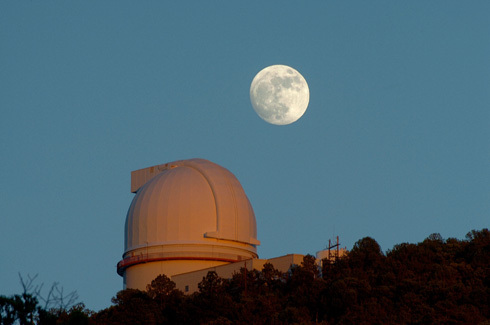 McDonald Observatory joins the Moon Race with an innovative new reflector. In the mid 1960s, NASA was planning to send robotic probes to the Moon and planets as fast as it could build them, and it needed help from telescopes on the ground to support those missions. Most existing telescopes were fully booked, though, so they could offer little assistance. So Harlan J. Smith, the ambitious new director of McDonald Observatory, offered to help. He proposed that NASA pay for a big new telescope at McDonald. 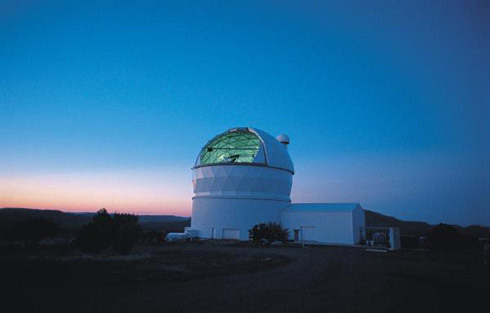 The University of Texas would pay for the dome, and much of the telescope's time would be dedicated to observing the worlds of the solar system. NASA agreed, and planning for the new telescope, which today bears Harlan Smith's name, began in 1964. The telescope's 107-inch mirror was made by Corning Glass — the same company that cast the 200-inch mirror for the Palomar telescope in the 1930s — using a relatively new technique. Chunks of silica were melted together to produce a mirror that was stronger and tougher than glass and that didn't "flex" as much under changing temperatures. Construction was completed in 1968 on Mount Locke, not far from the observatory's original 82-inch telescope. Built by Westinghouse for about $5 million, the 160-ton telescope was then the third-largest in the world, with a light-gathering power one-quarter million times greater than the unaided eye. It began regular observations in 1969. The telescope's planetary studies played a significant role in preparing for more detailed exploration of the solar system by spacecraft, and in understanding the results of those missions. 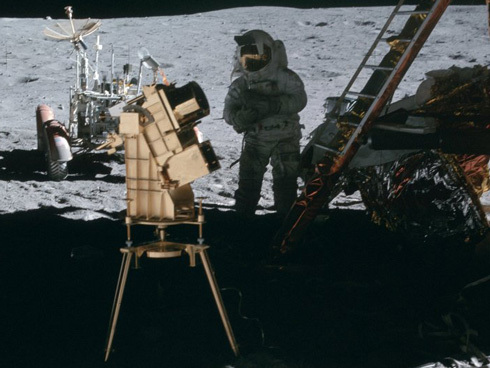 For almost a decade, the telescope also bounced a laser beam off mirrors left on the Moon by Apollo astronauts in a program called lunar laser ranging. These results helped refine the distance to the Moon and enabled a better understanding of its interior. Today, many different instruments are fitted onto the Smith Telescope, enabling many different types of astronomical observations. The telescope has been extensively used to study the compositions of stars and the motions of galaxies, and to search for planets around other stars in our galaxy. It continues to be used every clear night of the year. Apollo 16 astronauts operate the first telescope on the Moon, a camera that looks at ultraviolet wavelengths. Every new research telescope has a few bugs to work out. But for a telescope that was used in April 1972, there wasn't much time for troubleshooting. The telescope was on the surface of the Moon, and the crew of Apollo 16 had only three moonwalks in which to set it up and aim it at its targets. The telescopic camera was designed to look at the ultraviolet sky. Ultraviolet light is produced by hot, energetic objects, but it's absorbed by Earth's atmosphere, so it can't be studied from the ground. The Apollo 16 instrument was the first telescope of any kind ever sent to the Moon. 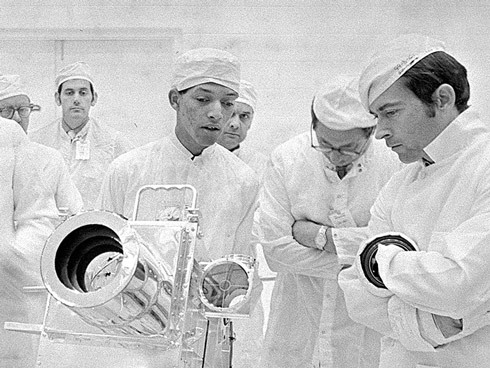 Physicist and engineer George Carruthers designed the Lunar Surface Ultraviolet Camera to look at the ultraviolet glow of Earth and to map as many ultraviolet-producing objects as possible during the brief moonwalks. Carruthers had tested smaller versions of the camera beginning in 1966 on sounding rockets, which briefly climb above the atmosphere before falling back to Earth. Apollo 16 commander John Young set up the telescope in the shadow of the Lunar Module, Orion, to keep it cool. Because the landing had been delayed by a mechanical problem, however, the Sun was at a higher angle than expected, so Orion's shadow was not as large as planned. With the changing angle to the camera's targets, Orion sometimes got in the way, too. The camera was also hard to point. Its lubricant froze up, so it took some brute force to aim it, which often left the camera off-kilter. Even so, it was a success. It snapped 178 pictures of Earth's aurora, the Milky Way, and other objects. It also obtained spectra of several objects, including the Large and Small Magellanic Clouds, two satellite galaxies of the Milky Way. A backup version of the telescope later flew aboard the Skylab space station in Earth orbit, where astronauts used it to photograph Comet Kohoutek and other targests. Today, several orbiting telescopes observe the universe in ultraviolet light, and scientists and engineers are developing plans for possible future telescopes on the Moon. Since the Moon has no atmosphere, images taken from the surface are sharper than those shot from Earth-bound telescopes. Telescopes can operate day and night, since the sky remains black. And the Moon offers a stable platform for astronomical observations. But the ubiquitous lunar dust could be a problem, gumming up mechanical parts and short-circuiting electronics, and temperature control could be a problem as well. Even so, recent efforts have looked at ways to make telescope mirrors and other parts from the lunar soil, or to build giant spinning mirrors filled with a reflective liquid material. Such efforts are built in part on the success of the Apollo 16 experiment more than a third of a century ago. Hubble Space Telescope enters orbit. What a difference a millionth of an inch can make. When Hubble Space Telescope (HST) transmitted its first pictures of the universe in 1990, astronomers were stunned by their fuzziness. While the pictures were somewhat clearer than those snapped through ground-based telescopes, they were far from the stunning tableaux promised before the telescope was launched. HST and its builders became national jokes, with one pundit calling the $1.5 billion observatory the "Hubble space paperweight." An investigation revealed that HST's 94-inch (2.4-meter) primary mirror was slightly flatter than it should have been — by about a millionth of an inch. Because of the flaw, known as spherical aberration, light from different parts of the mirror did not come to a focus at the same point above the mirror, as planned. During five spacewalks, astronauts aboard space shuttle Endeavour install corrective optics and a new camera to sharpen the telescope's view. They also replace its power-generating solar panels, two gyroscopes, part of its computer, and other spacecraft systems. The crew of Discovery installs a new infrared camera and a spectrograph that uses technology that was not available when the telescope was built more than a decade earlier. They also replace one of the Fine Guidance Sensors, which help point the telescope, as well as its data recorder. Discovery pays a return visit to replace all six of the telescope's gyroscopes, which aim it at the correct point in space, and one of the Fine Guidance Sensors. Astronauts also installed a new computer, new "blankets" to keep the electronic systems warm, a new data recorder, and other equipment. The crew of Columbia installs the Advanced Camera for Surveys, which is HST's most-capable camera to data. The astronauts also bring an infrared camera back online by replenishing its coolant. Finally, they install smaller but more powerful solar panels. Astronauts aboard space shuttle Atlantis install a new camera and spectrograph and repair another camera that had failed. They also replaced the spacecraft's 18-year-old batteries, its six gyroscopes, and one of its Fine Guidance Sensors. They added new insulation and a new computer control system. And they installed a device that will allow a robotic spacecraft to capture Hubble and safely deorbit the telescope once its mission is completed. NASA engineers devised a cunning plan to rescue the observatory, though. Taking advantage of the fact that the telescope was designed to be serviced by space shuttle astronauts, they produced a package of corrective lenses that sharpened HST's view, just as contact lenses correct vision in the human eye. 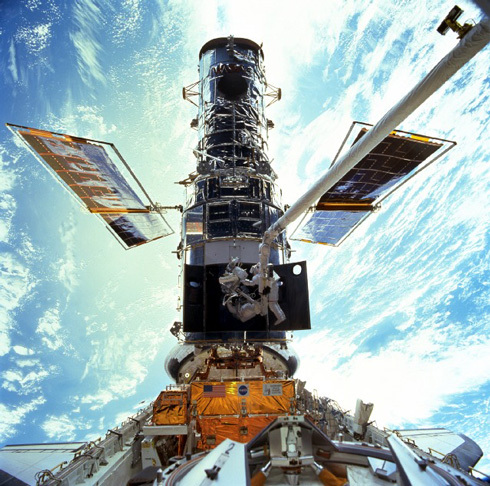 With the new lenses in place, Hubble transmitted stunning images of the universe, rescuing both its scientific mission and the reputations of its operators. Over the next two decades, the observatory became a national treasure, with its pictures appearing on hundreds of magazine covers, newspaper front pages, and television news stories. In fact, when NASA considered chopping the final HST servicing mission after the 2003 loss of space shuttle Columbia, the national outcry — some of it from the same pundits and politicians who had ridiculed the observatory after its launch — convinced the space agency that it was worth the risk of one more shuttle flight. It was just one more example of the space telescope defying the odds. German rocket pioneer Hermann Oberth first proposed placing a telescope in space as early as 1923. Earth's atmosphere blurs the view of the night sky, which is why the stars twinkle. It also prevents most forms of electromagnetic radiation from reaching the surface, including X-rays, ultraviolet, and infrared. Therefore, a telescope in Earth orbit or beyond can not only see more clearly, it can see forms of energy that are completely invisible to ground-based telescopes. American astronomer Lyman Spitzer championed space-based telescopes in a 1946 report for the Department of Defense, and oversaw one of NASA's early small space telescopes in the 1960s. He also chaired a National Academy of Sciences committee that, in 1969, recommended the construction of a space telescope with a primary mirror 120 inches (3 meters) in diameter. Considering that such a mirror would equal the second largest then in use on Earth, it was an audacious suggestion. And in fact, the size was a little too audacious. NASA was interested in building a large space telescope, but after the Apollo program achieved its goal of landing a man on the Moon and returning him safely to Earth, Congress slashed NASA's budget. The agency finally settled on a 94-inch mirror and approved the Large Space Telescope in 1977. It was a difficult engineering and construction project, requiring several delays. Finally, it was scheduled for launch aboard a space shuttle in late 1986. But when the shuttle Challenger was destroyed on January 28 of that year, the telescope — now named for Edwin Hubble, the astronomer who proved that the universe is expanding — was placed in storage while NASA sorted out the future. When shuttles returned to flight, Discovery lofted HST to orbit on April 24, 1990. Despite the initial disappointment and anger, HST has completed two decades of leading scientific research. Astronauts have upgraded and repaired the telescope five times, with the final service call in 2009. Astronomers hope this final mission will keep the telescope in service for another five years or more. The 10-meter Keck Telescope, which has a segmented mirror, enters service in Hawaii. By the late 1970s, the 200-inch telescope at Palomar Observatory was still the world's leading telescope, even thought it had been in service for three decades. (The Soviet Union had built a 236-inch telescope, but it was far less productive than the Palomar instrument.) And the combination of technology and basic physics made it seem unlikely that observatories would be building anything bigger in the foreseeable future. Until Jerry Nelson came up with a new idea. At about the same time that Jerry Nelson was envisioning a giant mirror made of multiple segments, Arizona astronomer Roger Angel was envisioning a rebirth of the giant single mirror. He devised a way to cast single-piece glass mirrors that are thinner and lighter than those made with earlier techniques, and that adjust to changing nighttime temperatures more quickly. Angel puts chunks of glass into a spinning oven, and heats and melts the glass. As the oven rotates, it pushes the glass outward, forming a disk with a curved shape. The interior of the mirror has a honeycomb shape, with large open cells. This dramatically reduces the mirror's weight, which also reduces the size and weight of its support structure. The mirrors are curved in such a way that they have short focal lengths (a small "f/stop" in photographic parlance), so they use shorter tubes or mounts than older designs. That means the completed telescopes fit inside smaller domes, which cuts construction time and costs. Since the late 1980s, the Steward Observatory Mirror Laboratory, beneath the University of Arizona football stadium, has turned out more than a dozen telescope mirrors. 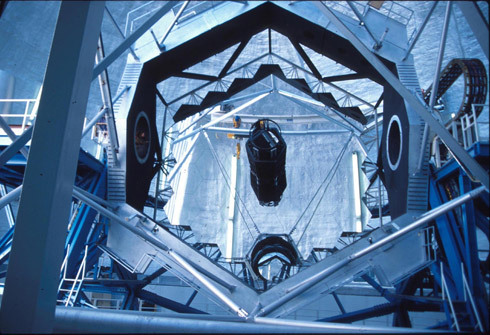 The first measured about 1.8 meters (72 inches) in diameter, but the lab quickly scaled up to produce mirrors of 3.5 meters, then 6.5 meters, then 8.4 meters (compared to the Palomar telescope's 5.1 meters, or 200 inches). Today, Arizona-made mirrors form the heart of some of the world's leading telescopes, including the Large Binocular Telescope and the Magellan Telescope in Chile. The young University of California astronomer was considering the limitations of giant telescope mirrors. For one thing, a big mirror is so heavy that it can slump under its own weight, deforming its precisely curved shape and ruining its view of astronomical objects. For another, as night falls and the temperature drops, a telescope mirror shrinks a little. A bigger mirror takes more time to reach its final shape, which delays the start of a night's observations. So Nelson suggested that instead of a single giant mirror, UC construct a new telescope with a mirror made of many small segments pieced together like the tiles on a floor. His design called for 36 hexagonal segments, each of which would be 1.8 meters (six feet) in diameter and only three inches thick. Together, they would form a mirror 10 meters (33 feet) in diameter, giving it four times the light-gathering power of Palomar's 200-inch telescope. This design would not only eliminate the problems of single giant mirrors, it would reduce the weight of the final telescope by many tons, thereby reducing the cost. UC accepted the design in 1978 and began engineering studies and fundraising. It later partnered with Caltech, and in 1985 they received a $70 million grant from the W.M. 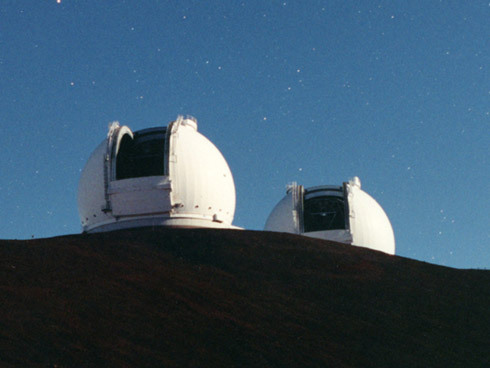 Keck Foundation to build the telescope atop Mauna Kea in Hawaii. Although Nelson's design alleviated some problems, it created new ones. For example, although the entire mirror assembly would form a symmetrical curved surface, the individual segments would all have odd shapes. It's been compared to a potter trying to create a curved bowl by piecing together small lumps of molded clay. Working with engineers at Lawrence Berkeley Laboratory, though, Nelson devised a technique in which each segment was "bent" to a pre-determined shape, then polished like a normal mirror. 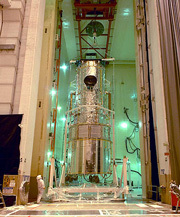 When the pressure was released, the mirror would relax and assume the correct shape for its place in the overall mirror array. Also, the individual segments had to maintain a precise alignment to produce good views of the sky. Yet the heating and cooling cycle, the motions of the telescope, and other factors would jiggle the segments around, preventing them from forming the proper shape. Nelson's team devised a series of electronic sensors to monitor the position of each segment, and computer-controlled motors to move each segment a tiny amount each second to maintain the proper alignment. 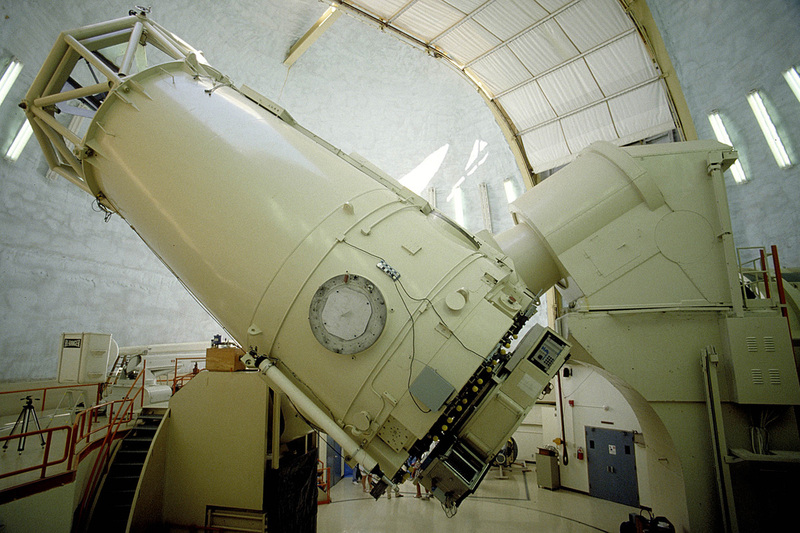 Despite the technical challenges, the Keck Telescope was completed in 1993. It was so successful that an identical twin was built next to it in 1996. Continued technological innovations have improved the Keck I and Keck II view of the sky. Both telescopes use adaptive optics to compensate for the blurring effects of Earth's atmosphere, greatly sharpening their images. And the two telescopes can be linked together to form an interferometer. That allows them to see astronomical objects far more clearly than either telescope working alone. Nelson's innovate idea produced the world's largest and most powerful individual telescope, and inspired other astronomers to consider even more innovative techniques for building giant telescopes. The Hobby-Eberly Telescope, built for a fraction of the cost of other giant telescopes, is dedicated at McDonald Observatory. The world's largest optical telescope mirrors were inspired by the world's largest radio telescope. In 1983, Penn State astronomer Daniel Weedman proposed a giant new optical telescope that would operate like the Arecibo radio telescope in Puerto Rico. The giant Arecibo dish is built in a bowl-shaped depression in the hills, and always stares straight up into the sky. But a tracking device suspended above its reflective surface moves back and forth, allowing the telescope to track astronomical objects as Earth rotates on its axis. Weedman's original proposal called for a mirror made of 10 segments, each 3 meters (10 feet) in diameter. The mirror array would remain fixed so that it always looked straight up, but a tracker would move across the mirror to follow astronomical objects as they passed overhead. Since the telescope itself wouldn't move, it wouldn't need the same type of support structure as conventional designs, greatly reducing its weight and cost. And its method of tracking astronomical objects would make it well suited for surveys, in which it captures fairly short but high-quality observations of many different targets every night. Over the following year, Weedman and fellow Penn State astronomer Larry Ramsey conferred with several telescope experts and modified the original design. Their new concept was named the Spectroscopic Survey Telescope. When it was completed a decade later, it was renamed the Hobby-Eberly Telescope (HET). Under the revised concept, instead of pointing straight up (at the zenith, in astronomical parlance), the mirror would be tilted at an angle of 55 degrees relative to the horizon. It would be mounted in such a way that it could rotate 360 degrees, allowing it to see about 70 percent of the sky. The assembly at the top of the telescope would move across the mirror, allowing HET to track individual targets for about an hour. This design would provide the performance of a giant telescope at a fraction of the price of older designs. Penn State teamed with The University of Texas at Austin to build the telescope atop Mount Fowlkes at McDonald Observatory. 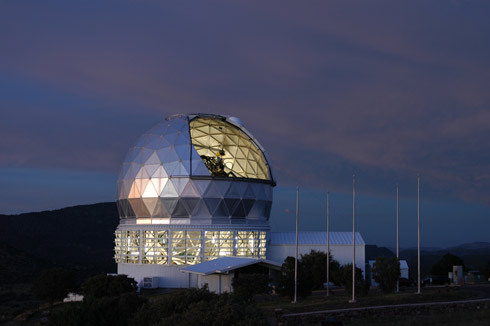 Development began in the late 1980s, and the telescope was dedicated in 1997, after three other partners joined the project team. HET's main mirror consists of 91 individual hexagonal segments, each of which is 1 meter (39.5 inches) across. 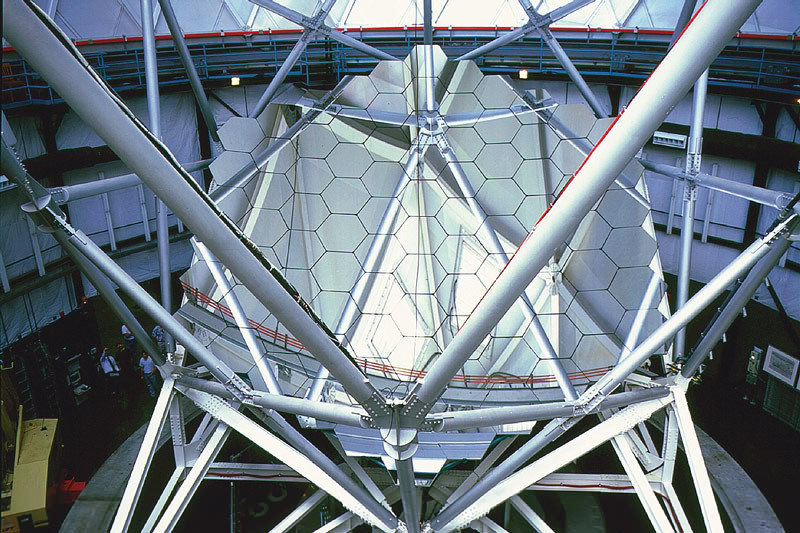 Three small computer-controlled devices attached to each segment constantly adjust their position to maintain the correct shape for the overall mirror, which is 11 meters (36 feet) in diameter — larger than any other telescope mirror in the world. Because of the way the telescope tracks astronomical objects, though, only 9.2 meters of the mirror area is used for each observation. That makes HET and a near twin based on the HET design, the South African Large Telescope, the third-largest telescopes in the world. The mirror forms a spherical shape, like a slice of a ball. That design allowed all 91 mirror segments to have the same shape, which greatly reduced construction costs. 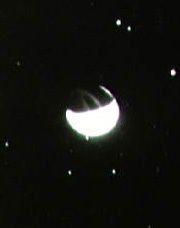 But a spherical mirror smears the light from its targets. Corrective lenses in the tracker assembly compensate for this effect and bring the view into sharp focus. The tracker uses fiber optics to feed light to spectrographs, which can be attached to the telescope or located in a climate-controlled room beneath it. These instruments split the light into its component wavelengths or colors, yielding details on a target's composition, motion, and more.